the next generation of engineers, and equipped to expand science and technology (S&T) research capabilities at these institutions. 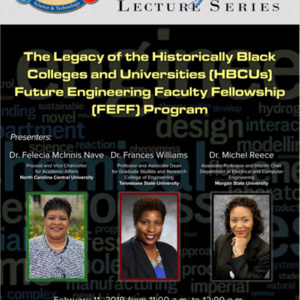 The HBCU FEFF Program supported over 50 engineering Ph.D. students during its existence. This panel features three highly distinguished HBCU FEFF alumnae, each of whom fulfilled the promise of the program, returned to HBCUs as faculty, and are now serving as leaders and administrators at various levels. During the panel, Drs. Felecia Nave, Frances Williams, and Michel Reece will share their experiences as program fellows, discuss the impact of the program from their perspective, and provide insight on the naval-relevant research underway at their institutions.